Your local Starbucks Reserve Bar is introducing two new delicious drinks beginning July 11, 2017. Don’t go looking for these at your core neighborhood Starbucks store – these drinks are exclusive to Reserve Bars, and there’s roughly 40 of them worldwide. The two new drinks are only available in United States and Canada Reserve Bar stores. You’ll Reserve Bars at 1st and University in Seattle, in Chicago’s Wrigleyville, a newly-opened Reserve Bar in Dallas, Texas, two Reserve Bar stores in New York City, a store in Redwood City, California, a new Reserve Bar in Waikiki and many other cities. Starbucks Nitro Cascara Cloud: For the Starbucks Nitro Cascara Cloud, Starbucks found inspiration from cascara, which is made from the dried fruit of the coffee cherry itself. The beverage is made with nitrogen-infused Starbucks Reserve Cold Brew, slow-steeped to bring out its dark chocolate body, berry notes, and rich, port-like flavor. The beverage starts with vanilla bean syrup, and then a long pour of the Nitro Cold Brew. It is topped with a velvety, merengue-like cold foam made with milk and cascara syrup, and finished with a dash of cascara sugar. The Cold Brew at Reserve Bars is often the famed Reserve Micro Blend No. 11, made with a blend of Sun Dried Ethiopia and Guatemala Antigua. 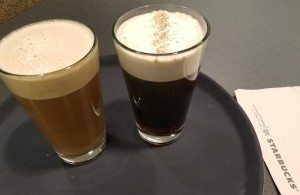 You might remember that in Starbucks stores everywhere in the US and Canada, this past January the Cascara Latte was a promotional, seasonal beverage. 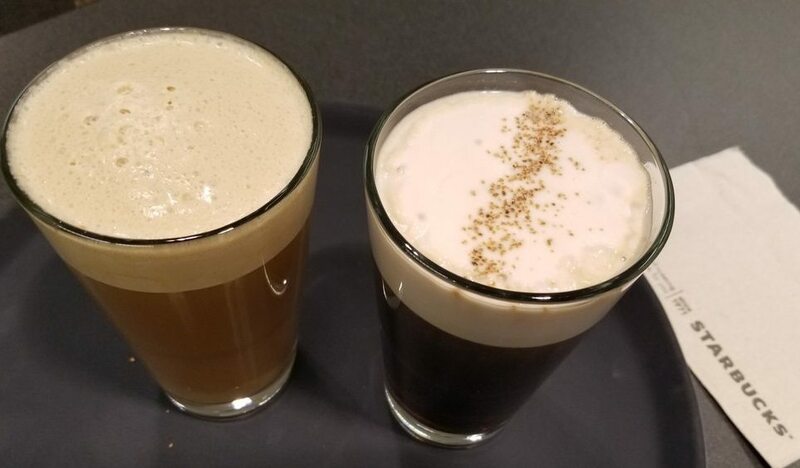 Starbucks Nitro Dirty Chai: In coffeehouse lingo, a dirty chai is a hybrid of coffee and tea, often made as a chai tea latte with a shot of espresso. Starbucks Nitro Dirty Chai is made with classic chai spindle-blended with cream, poured into the glass and topped with Nitro Cold Brew made with Reserve Cold Brew. The result is a rich, layered beverage with a creamy texture and a head of rich and airy chai foam. Even if you don’t want to try these two delicious creations, be sure to try Reserve Cold Brew which is the perfect meld of berry notes and rich flavor from Micro Blend No. 11. The Reserve Bars also use their spindle blender for delicious creations featuring Mora’s Ice Cream, a small Bainbridge Island, Washington ice creamery. You’ll find a spindle-blended Cold Brew Malt, and other ice cream creations in the Reserve Bar stores. Feel free to use one of your Starbucks Rewards to try one of these drinks totally free! I especially liked the Nitro Dirty Chai. It’s the perfect combination of sweet, spice, and lots of coffee-forward flavor. 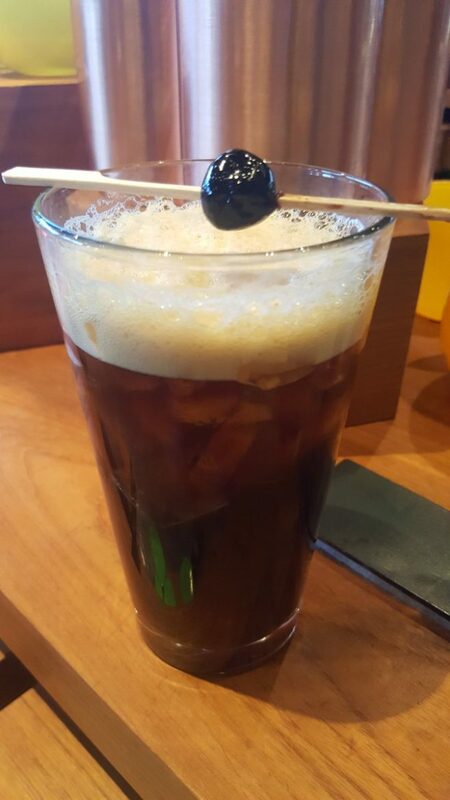 One customer favorite staple of the Reserve Bar locations is the Melrose, which is cold brew coffee with bitters, finished with a cherry. Another excellent drink that I have to recommend! There is no such thing as a Starbucks Reserve Store ... yet. So I fill out the customer service form to ask where the Reserve Bars are located. Time to “shame” Starbucks CS — pasted below is the absolutely useless answer I received after waiting FIVE DAYS for a reply. Amazing. I’d be more than happy to assist you with this matter!